Why did this crazy man smash up 15 cars at a Mazda dealership? The man was visibly drunk as he stumbled into the car lot more than three hours past midnight. He took a call on his cell phone, then became enraged. The dealership's security cameras caught every idiotic minute of what happened next. It started just before 3:30 am this past Saturday morning at John Hine Mazda San Diego. 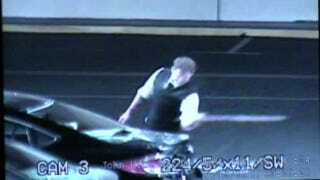 Edward Roth, 22, nattily clad in a vest, dress shirt and tie, began smashing 14 car windows with some sort of bat, kicked and severely dented at least one car door, smashed showroom windows and vandalized offices. When San Diego police finally arrested Roth, hitting him with a tazer after he brandished a rock at cops, he had caused an approximate $50,000 in damage, not including depreciation of the damaged cars. We may never know the nature of that phone call, but we do know that the dealership has no record of Roth ever having purchased a car there or having had one serviced. Apparently, it's just a random act of post-beer-pong rage.